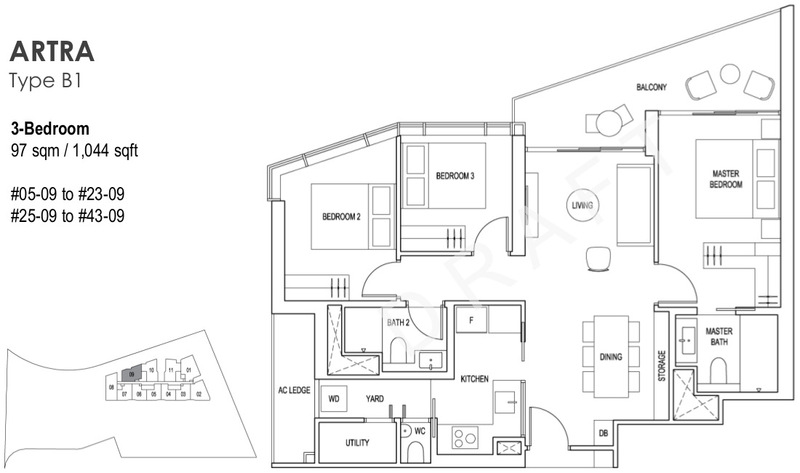 The Artra condo floor plan layouts comprises a mixture of unit types. 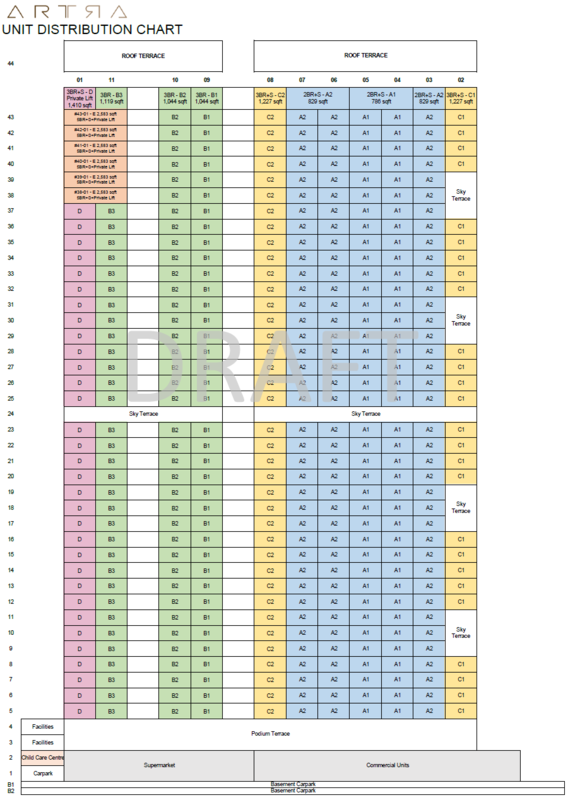 The draft floor plans are now available. Below are examples. 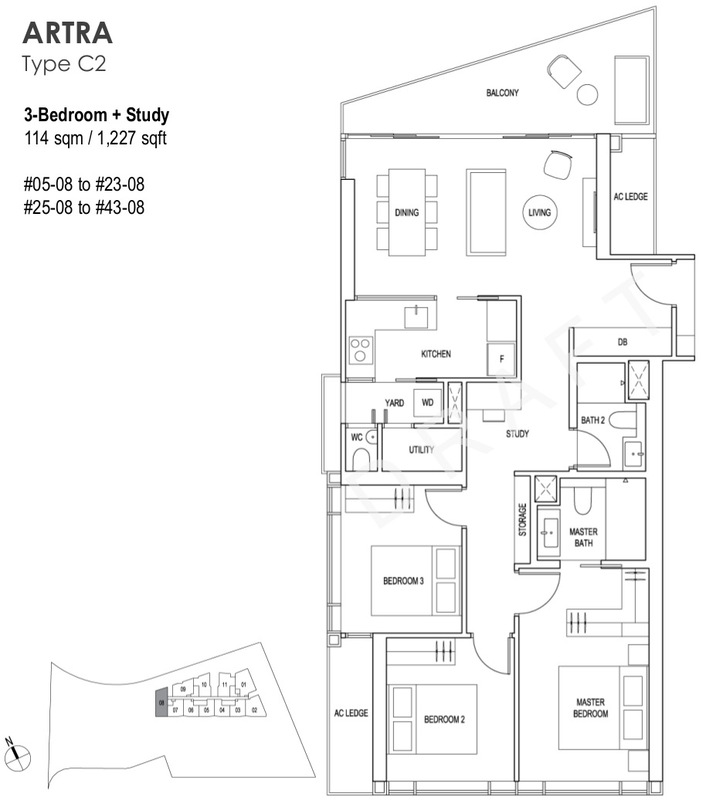 Please contact us below if you would like to have the Artra floor plans and site layout plan emailed to you. 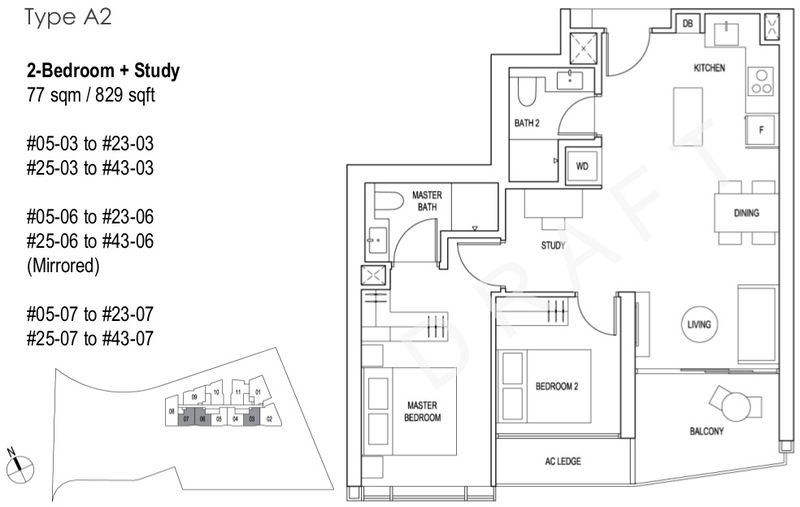 The Artra condo floor plan layouts goes against the current trend of ever smaller units and rooms. Instead, the units here are bigger than the norm for new launches, with even the standard 3 bedroom units above 1,000 sq ft, compared to new launches with 3 bedders below 900 sq ft.
At 829 sq ft, the 2 bedroom + study units are bigger than the norm for most new condos. The master bedrooms can accommodate a king-sized bed, as well as a walk-in wardrobe. This is one of the 3 bedroom types. The other type has an open plan kitchen that has sliding doors to enclose it, so that it can be used both ways. Both types have separate dining and lounge areas. The Artra is being developed by FEC Skyline Pte Ltd, a wholly-owned subsidiary of the Tang Group of Companies. The Tang Group has residential as well as hotel projects under their belt. They are in fact currently developing iMedini Walk, an integrated development featuring retail, office space, serviced apartments, and a hotel, near Legoland Malaysia. The Artra floor plans are interesting, not least because URA has placed a cap of 400 residential units on this project. Given the total GFA (gross floor area) allowed of 41,152.65 sq m, and taking away the maximum commercial GFA of about 2,000 sq m, this leaves about 39,000 sq ft for the residential component. Which works out to an average floor area per unit of around 98 sq m, or 1,055 sq ft. This is a fair bit higher than the average unit size nowadays, of around 70 sq m, or 753 sq ft.
For buyers who are tired of the small sizes of most new launches nowadays and looking for bigger units that are also new and near an MRT station, this could be a real chance to get their hands on one without having to settle for an old development. Besides the residential units, Artra will have a maximum of 21 commercial units, including a supermarket of at least 1,000 sq m or 10,760 sq ft. The other commercial units have to be at least 50 sq m, or 538 sq ft, or more each. Please register here if you would like the Artra floor plan brochure & site plan sent to you once available.